Follow our four man team's travels to the 'Land of the Morning' to encourage and support our brethren along with Ken Wilkey. One needs to experience this places in this world when the oppourtunity arises. We learn about differences and commonalities with our fellow man. We can see landscape and culture influencing each other. Paul observed culture and used it as part of his teaching. I think of his approach with the Corinthians and Athenians. 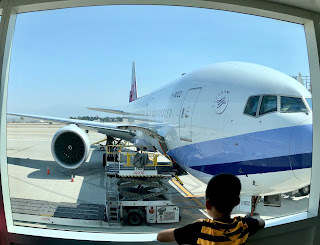 We took the opportunity on our layover to see a few things in around LA. I used to come to the area fairly regularly. So showing the team around was something I looked forward to. Hollywood on a Friday night. We drove up from the LAX area right into the heart of Hollywood. In-N-Out burger on Sunset Blvd? Yes thank you! A dude dressed up like Poseidon carrying a large Trident down a darkened street? Um yep… Not surprising that once you get to Hollywood Blvd. and the “Walk of Fame” you see some pretty crazy stuff. It hits you pretty hard as you observe the people and go from Hollywood into West Hollywood, as my brother Chris Carson says “they need the gospel”. One of the boys spoke up wondering about congregations in the area and mission work here. A tough work, but there are souls to win there. Malibu on a Saturday morning. We woke up and headed up the Pacific Coast Highway to Malibu. Some breathtaking views on the way to the famed beach community. One of our team's small goals was to put our feet in the water on the Pacific Ocean’s Easterly edge in California and Western edge in the Philippines. It was pretty cool seeing Matt and Luke experience the power of Pacific for the first time. California’s natural and varied beauty is something to behold and appreciate, and we thank Father God the Creator. China Airlines on a Saturday afternoon. We boarded our flight for the 13 hour flight to Taipei, Taiwan ROC. Aircraft and their systems are my livelihood and it never gets old seeing them upclose. The 777 we were to take flight on is an admirable piece of engineering. As I sit in row 63 I am comfortable for a coach seat and impressed all the way around with our crew. As a bonus Jake and Luke got to move to a set of 4 seats on the bulkhead...lots of legroom. They are loving it. We are just east of Tokyo now. The trip and our work is getting more real by the mile. Looking forward to meeting up with brother Ken in less than 20 hours in Metro Manila to begin.